So I think that Saturdays will be black-and-white days, and Sundays I won’t post anything, but will try to sketch out the week to come. 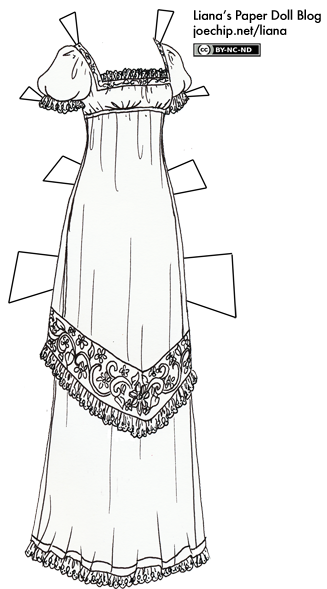 We’ll see how that goes… Anyways, for today just a plain Regency gown for people to color. Maybe for me to color at some point, too, but we won’t get ambitious just yet. Ooo, pretty. I like the over skirt whatchamacallit…. Will you still be doing mermaid mondays?? It’s so nice to see you back for real! I discovered your blog slightly after christmas, and i was dissapointed that you dissapeared after that. It’s really great you’re updating again, especially since i’ve acutally printed out some of your dresses and dolls to play with my kid cousin. Ivy was getting jealous that she didn’t have as many dresses as the other dolls! Oh how pretty! I usually don’t print the black and white outfits, because it makes me sad that I can’t color nearly as well as you XD But I shall attempt it. And it’s good to know you felt guilty about Mermaid Monday :P I’m on a mermaid kick like you wouldn’t believe. My little tongue-sticking-out face showed up in the wrong place…. Odd. I love this dress… oh i wish i had it to wear… it’d be so nice if we could wear these clothes again, but the washing lol!! Wow a lot happens when I’m distracted by school work. And your return is as grand as ever. I actually recommended you to a classmate a while back who said she was going to print (and cut) them out for her little niece, I think she’s gonna love the teddy bears. So glad to have you back, and I hope that last thief gets punished soon. By the way, I’m waiting for my printer to literally start yelling at me for making it work so hard. My boyfriend will be happy though that I’ll be distracted for a few days. Oooh! How lovely! It looks like something Wendy Darling would wear!!! So pretty, I would love to wear this! Its so great to see you posting again on a regular basis, it quite literally brightens up my day! Liana, Could you color this one in please I am the worst artist in history. I was once inpired by you to color a dress of my own and a friend told me it looked like a hippo. If you do color it could it be in pastely spirng colors like a pink or green?